Two houseguests were evicted this week but the first was eliminated days earlier. She has played the role of floater quite well until she chose a side after being nominated on the block. Unbeknownst to the majority of viewers, nobody really noticed her until the numbers started to dwindle. It's a great strategy that has worked well in the past. Since this evicted houseguest has been voted off in the latter part of the season, she'll return on finale night to decide which player will win the prize. She will be the fifth jury member. The next person evicted from the game is Jenn, the 37 year old musician from Brooklyn. Jenn is the tattooed former member of the metal rock band, Kittie. On Day 1, she was chosen, along with Frank and Ian, by Big Brother All-Stars winner Boogie to be on his team. Jenn sat pretty in the background for the majority of the game and played the role of house floater; rivaling such notable floaters from previous seasons. When the coaches entered the game, Jenn felt abandoned by her former coach and relaxed with other floaters Wil and Ashley in the backyard. She really started to play the game during Week 6 when Head of Household (HOH) Shane made her the replacement nominee against Boogie. 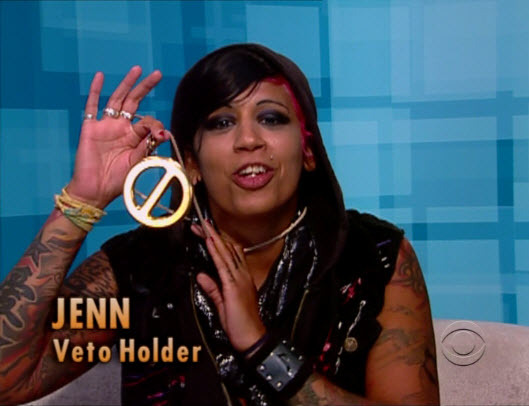 In Week 7, she won the critical Power of Veto (POV) that saved Dan from eviction but after Ian won HOH two weeks later, he made Jenn his target. On Day 67, Jenn was evicted by a vote of 2-0. Jenn played the majority of the game in the background - I'm not even sure if she knew she was playing Big Brother. After she was nominated by Shane, she started to gain some sense and learn more about how to play. It was very reminiscent of Porsche last season but Jenn didn't have any top-tier alliances left to help her. Wil was evicted, Ashley campaigned against her (also evicted), Boogie was gone and Frank was recently sent packing. She did have the alliance of Dan and Danielle who legitimately worked with her for a Final Three deal. However, Ian (the HOH) was still pro-Quack Pack alliance and made Jenn his target. Dan, Danielle and Jenn had originally planned to get out Ian but were forced to target Shane (much to Danielle's dismay). For the plan to work, Shane couldn't win POV but he did and Danielle was the replacement. She had more friends in the house and the Quack Pack alliance still dominated in numbers. Jenn was never really part of any powerful alliances early on and since she only started playing halfway through the game, none of her connections were there save or help her. Jenn needed to make the right moves. Without any of her previous friends left in the game, she had to rely on herself and the only smart move left was to get Ian to turn on Dan. The Shane/Danielle alliance was powerful but the Dan/everyone alliance was an epic monster. With him out of the way, everyone else had a better shot to win. Jenn should have confronted Ian and give some sense to the kid and explain that Dan was a fire that needed to be put out. The Quack Pack alliance had to be split up and Dan blindsided but it never happened. Dan's Mist worked again. Jenn's experience can be explained in one word: mysterious. Nobody noticed her, she barely had any airtime, could not win a single competition except once, and never was the target till near the end. I liked her as a character (and to a lesser extent, a competitor) later on but it irritates me when houseguests (who never watched a single episode before playing) get a chance to play. When she realized she was in a game, Jenn really started to play but it was too late in the season. Luckily for her though, she won't have the record as most useless player who did nothing all season - that's still Adam from Big Brother 13.